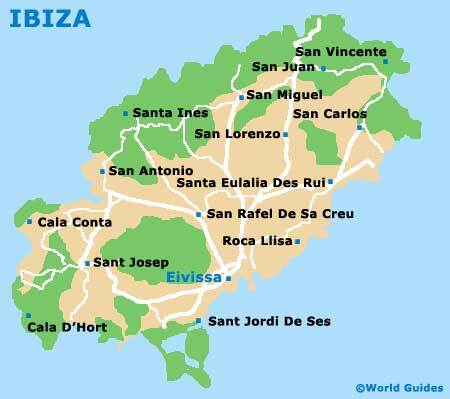 The Spanish island of Ibiza resides within the Mediterranean Sea, being the third-biggest of all the Balearic Islands, after only Mallorca and Menorca. Together with Formentera, Ibiza is part of the Pine Islands (Pityuses), a sub-archipelago based on the western side of the Balearics. 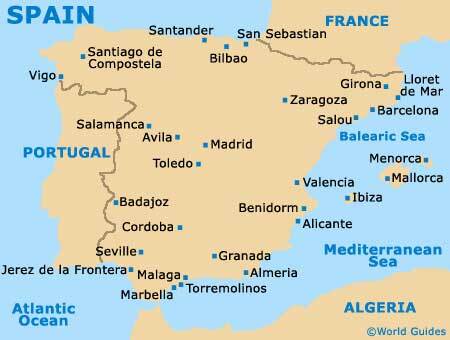 Prominent locations on the island include the capital - Ibiza Town (Eivissa), San Antonio (Sant Antoni) de Portmany and Santa Eularia des Riu. Marking the highest point on Ibiza is the mountain named Sa Talaiassa, which sits on the south-westerly side of the island and measures at just over 470 metres / 1,540 feet. Within Eivissa, D'Alt Villa serves as the historic walled town, enjoying an elevated hilltop setting and some superb views. Nearby, in the direction of the harbour, Sa Penya is an interesting district, comprising narrow roads and alleys, countless whitewashed buildings, and a wealth of traditional shopping and Spanish-themed dining opportunities. The Passeig de Vara de Rey is a notable promenade, which connects Avinguda d'Espanya with Sa Penya. If you are hiring your own set of wheels for the duration of your holiday and feel the need for maps of the island, then check out the tourist office on the Passeig des Moll, or alternatively the tourism outlet at Ibiza Airport.